The information below will help guide you through the process of restoring an antique (or modern) piece of cast-iron cookware. I have spent many years collecting and restoring dozens of antiques. My goal through this article is to save you time and frustration — however, once you learn the basics, the process is fairly straightforward and extremely rewarding. 1. 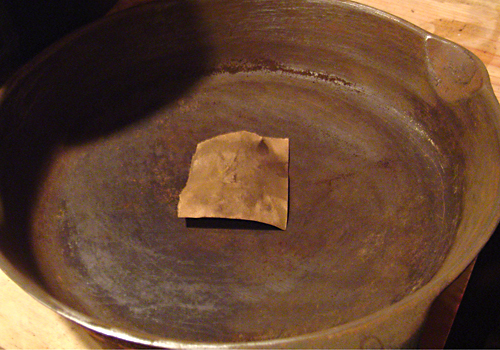 Remove all traces of rust on your antique pan. You can use a wire brush, coarse steel wool, or wire bonnet attached to a power drill. A final wipedown with CLR cleaner will remove residual rust deposits. You can also use a 50/50 diluted solution of water and white vinegar. Depending on the amount of rust, this may be a small amount of work or an all-day job. DO NOT USE MACHINE OIL OR ANY OTHER harsh cleaner, as this will taint the metal and is toxic for food preparation. 2. Remove carbon build-up. If you have large areas with carbon build-up you can remove this by throwing the pan in your fireplace over a lit mound of newspaper or dry leaves. Fire for 1/2 hour over LOW heat. Old-timers used to clean their pans every few years by putting them on a dry leaf pile and burning it until the metal was shiny. This method doesn’t produce intense heat, which will risk warping or cracking your pan. Another method that is purported to produce great results: Your oven set to the auto-clean cycle. Leave the pan in until it completely cools and make sure your oven vents to the outside of the house. This puts off a LOT of smoke. When done, simply wipe down with clean hot water and a sponge. Re-season as instructed. You need to be careful with this method, as some ovens get very hot – too much heat can affect the structure of the iron, causing damage. 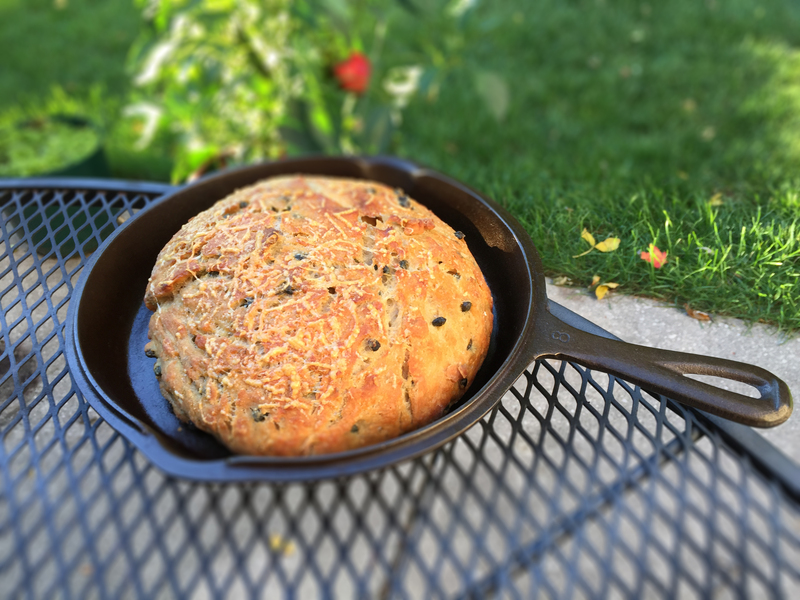 Test with a clunker skillet before using this method on heirloom antiques. 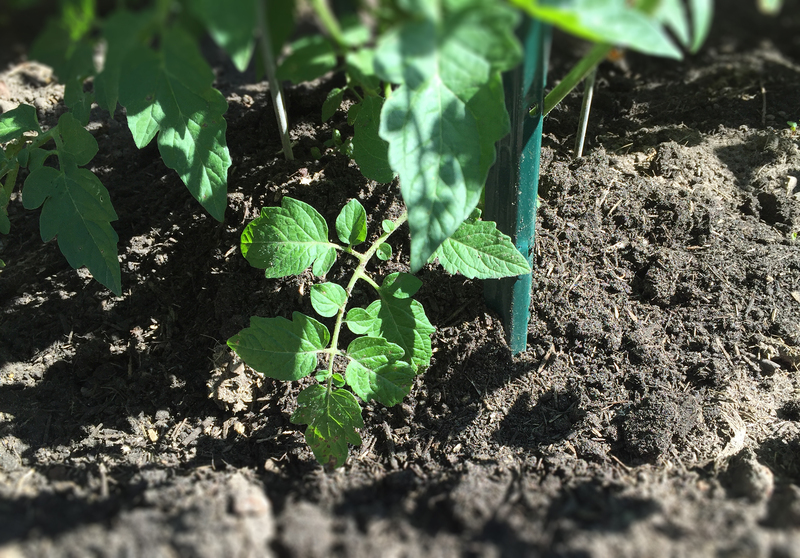 You can also use a portable propane torch on problem areas – provided you take care not to get the metal too hot, thereby risking warping or cracking the pan. Keep the torch moving to disperse the heat. My tried-and-true method includes a trash bag, a can of Easy-Off oven cleaner and a lot of patience. Spray down the entire surface of the pan or skillet with the cleaner and seal it in a trash bag for at least 24 hours. Using rubber kitchen gloves, wipe off the sludge with paper towels, repeat if necessary and then scrub and rinse as instructed. You may need to use a razor blade to scrape off any remaining stuck-on bits of carbon. This method is so effective because Easy-Off contains lye, a powerful chemical that will efficiently dissolve built-up carbon, without damaging the iron. Easy-Off does not remove rust. 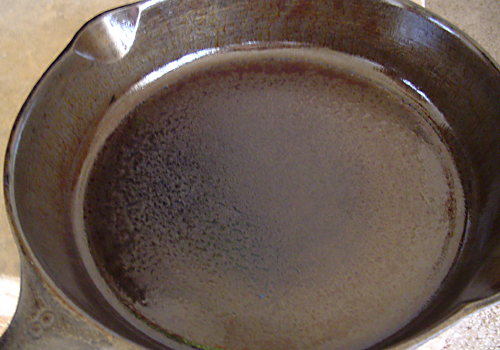 If you see existing rust on your pan after using the Easy-Off cleaner, scrub the iron with a 50/50 vinegar and water solution, or CLR cleaner. Then scrub with fresh hot water and dry immediately. My dad told me stories of my grandfather who used beach sand to strip any built-up carbon gunk or rust from his pans. 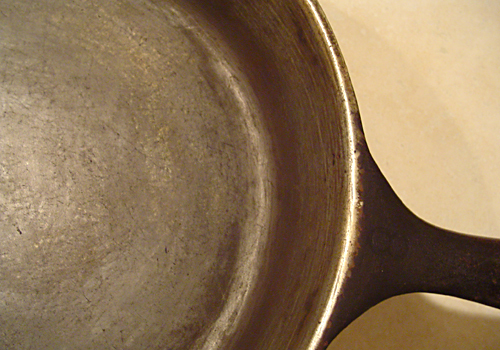 Regardless of the method for removing rust or buildup – properly taken care of pans should never rust again. 3. 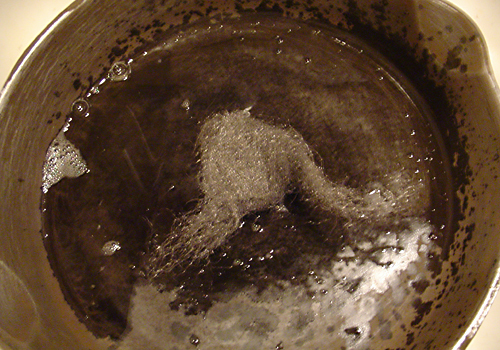 Rinse pan with very hot water and scrub with a plastic bristle-brush with a small amount of dish soap. Dry immediately with paper towel and inspect all areas for rust. This includes tight corners around handle, bail and the hanger eyelet. If there are still traces of rust, repeat step 1. 4. Cleaning and seasoning. Once you have ensured that all traces of carbon and rust are removed from the surface, it is time to clean, season and seal the surface of the cast iron. After scrubbing, IMMEDIATELY make sure the pan is completely dry and free of rust, uneven buildup or other residue (rust will set in again on bare metal within 5 minutes.) Use wads of paper towel to remove any residue until they wipe clean. Heat your oven to 375 degrees. Place the pan in the preheated oven for 15 minutes – this will expand the pores of the iron and allow the coating to penetrate and protect the metal. Remove the pan with hot pads, and evenly coat the surface (USE CAUTION, IT’S HOT!) with a small amount of plain vegetable oil, Crisco shortening or rendered bacon fat. Do not use olive oil, as it has a very low smoke point resulting in a poor bond with the iron. Less is more with this process. Wipe away any excess, ensure that all exposed surfaces are evenly coated, and place back in the oven for no less than one hour. TURN ON YOUR EXHAUST FAN and open your windows. The pan will smoke slightly. This is normal. Turn off the heat and leave the pan in the oven until cool. If you see a sticky oil/fat buildup, you used too much. Heat the pan again as shown above and wipe the excess off with paper towel or soft cloth, ensuring the surface is evenly covered. 5. Care and use. Congratulations! Your pan is now seasoned. The first few times of use, avoid cooking overly-acidic foods like tomatoes or vinegar-based products. Also avoid boiling water until the surface cures. If you should smell rust when inspecting the pan or taste a metallic residue after preparing a meal, repeat the above steps to ensure it is properly seasoned. There is no need to completely wash the pan after preparing a meal. Again, do NOT use dish soap. Simply rinse it out with hot water and scrub with a plastic or bamboo bristle brush. Then, wipe a small amount of cooking oil or Crisco shortening evenly on the cooking surface and heat over medium heat until it just starts to smoke. Shut off the heat and let it cool on the burner. The heat will kill any bacteria and leave it ready for your next meal. IMPORTANT: NEVER clean a hot pan with cold water. NEVER quickly immerse a hot pan in dishwater. NEVER quickly heat a pan over intense, high heat — instead, allow it to come up to temperature gradually. Allow the pan to cool before cleaning to avoid thermal shock, which will warp or crack the iron. When cool, carefully run very hot tap water or boiling kettle water in the pan and scour with a bamboo or plastic bristle brush. Pans that exhibit thermal shock may be warped to the point of not sitting level on a flat glass stove top. I’ve seen this issue with a lot of old Wagner iron, because they are cast thinner and lighter. Once warped or cracked, there is no way to fix the issue. Take care, and ensure that your pans become treasured heirlooms. They, in turn, will give you a lifetime of memories. 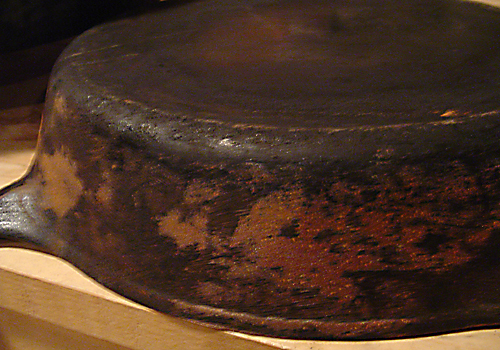 A badly-neglected Wagner skillet with extreme corrosion and carbon buildup. 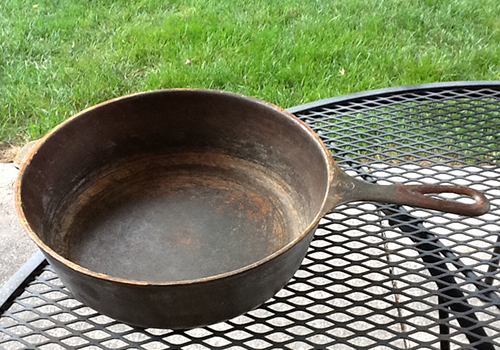 Amazingly enough, even this clunker can be restored to a usable piece of cookware. Scouring out rust and carbon buildup using 220-grit sandpaper. Move on to 600-grit to smooth out the scratches. Then finish off with steel wool. 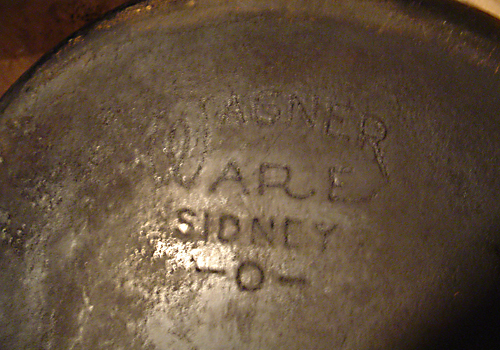 Corroded Wagner stamp on a cast-iron skillet. Take care not to sand out the maker mark when restoring a finish. (This pan was manufactured in the Depression era so there’s a fair amount of history!) Use a Dremel and a fine wire wheel brush with a light touch for detail work like this. 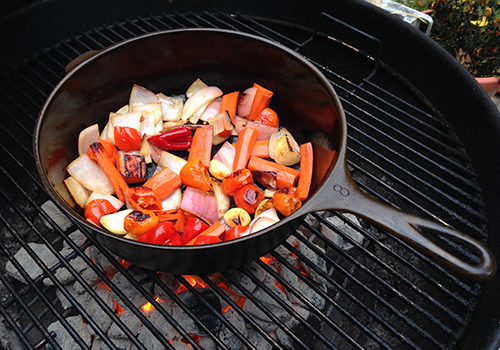 A properly-scoured cast-iron pan. All pitting, scratches, corrosion and carbon buildup should be removed. 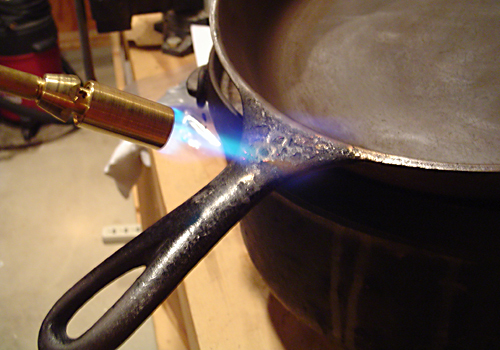 Using a propane torch to remove built-up carbon. Carefully heat until the carbon turns white-hot and converts to ash. Keep the torch moving! Don’t heat up one spot too much or it will warp. When cool, wire brush off the gunk or scrape with a utility razor. Preheat your newly-scoured cast-iron pan in the oven at 375° for 15 minutes. Then wipe down lightly with vegetable oil, Crisco shortening or bacon fat and bake for 1 hour. Let cool before removing. 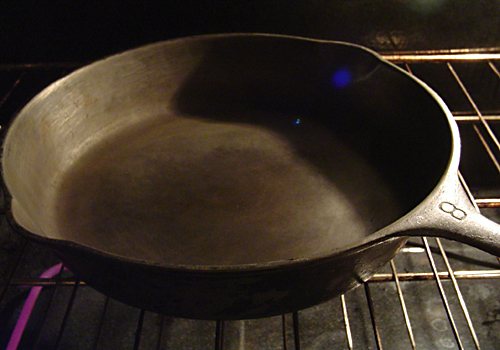 New vegetable oil finish on a cast-iron pan. It will take months of regular use to blacken and cure rock hard. 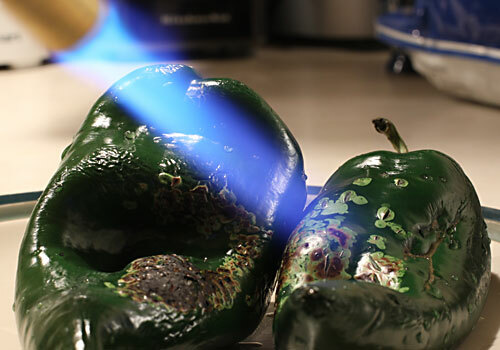 Avoid cooking overly-acidic foods or boiling water the first few times of use. After that, they’re pretty much low-maintenance when cleaned properly. 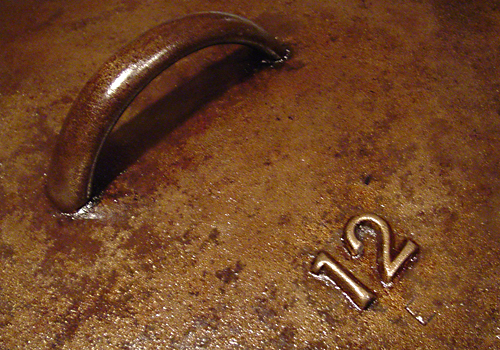 A newly-refinished antique cast-iron dutch oven pot cover. A dremel and wire wheel brush worked well for removing the carbon buildup around the stamping. The speckled caramel color is normal and will darken over time. The dark spots are residual carbon that protect the iron. Note the consistent, even application. Eventually, it will all turn jet black. A rusted Wagner #8 chicken fryer that my wife found abandoned in a cupboard at work. (The cleaning staff was actually going to throw it out!) After some TLC, it has proven to be one of my favorite pans. Before purchasing an antique, set it on a flat surface and ensure it sits level, without wobbling. Many old pans are warped – it’s best to stay away from them as they will not heat evenly on a modern ceramic cooktop. This beauty is dead-level and dates from the mid-1930s. Sadly, it didn’t come with its matching drip-drop cover. The cover alone runs about $50 on eBay and is a very rare item. The same Wagner #8 chicken fryer, painstakingly restored. Luckily, the rust was mostly on the surface, with no deep pitting. Look at that slick black finish! I’m using it here on the grill to fire habañero peppers for my home-made hot sauce. 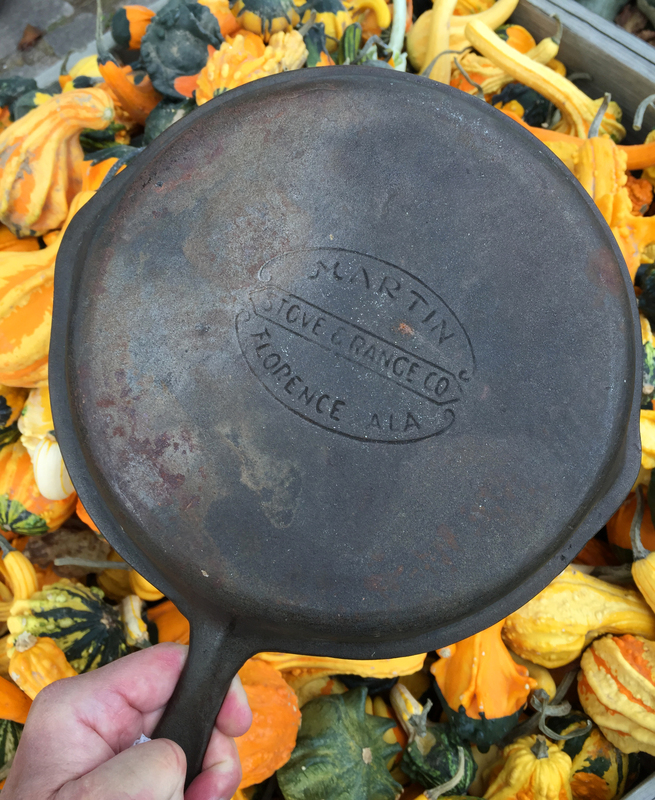 A rare, vintage Martin #8 cast-iron skillet I picked up at an antiques store. It shows only minor surface rust and was easily removed with steel wool. The pan has a very slight wobble and no carbon buildup – so it was either never used, or stripped to bare metal and then not stored properly. 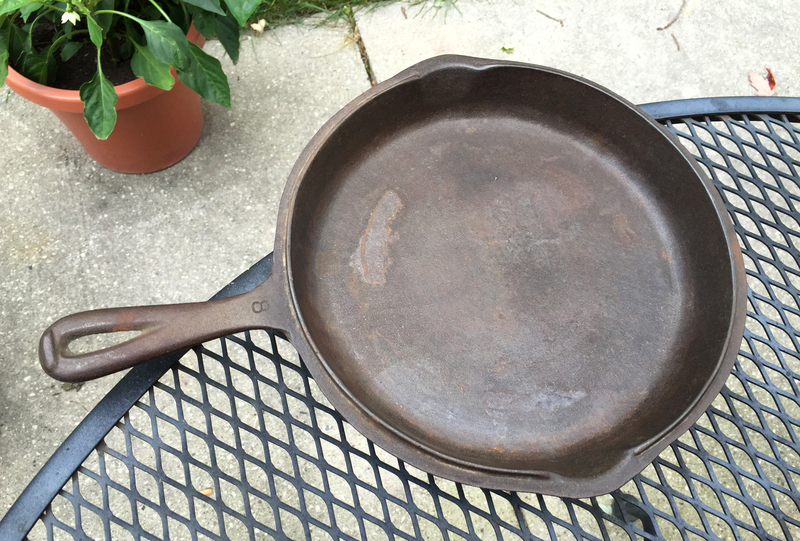 The same Martin #8 cast-iron skillet showing very minor surface rust on the top. This is easily removed with fine steel wool and a little patience. Thank you for the information. It was helpful as I was really confused on how to clean my old cast iron pan. Thanks for the nice comment, Carolyn. I made a lot of mistakes starting out when i first used mine, and my mom threw out my grandmother’s pans because they were rusty. I’d give anything to have them back to properly restore them. Nothing else compares to them. know what you mean, like to have them back. well think of it this way. perhaps someone seen them in there, and did get them out, or something and is using them right now. some comfort in that i would think. dont think youll even see them again though, thank you for the story though, made my heart get warm. Agreed, Hal. Thanks for the comment.